email subscription popup blogger plugin. Maintaining email list is one of the important thing in blogging world. With this you can call you loyal readers many time on your blog may be every time whenever you publish the new post. There are many companies providing email subscription service like marpost, mailchimp etc. All of them are not free but feedburner by google is free for life time. It doesn't matter whether you are on blogger or wordpress platform. Feedburner allows you to configure for both and allows you to send free email to your subscribers whenever your publish the new post. But have you ever thought how to collect email id's of your readers and maintain one good email list to increase your blog traffic ? Well for that you can put one awesome and stylish subscription box on the right side or at the bottom of every post on your blog and you can also fire email subscription popup box (look at the above snap shot). This is considered the best strategy to collect email id's. I hope you guys have already configured your blog with feedburner and have already added one email subscription box on your blog. If not, then may be we will see one detailed tutorial about the same on some other day. 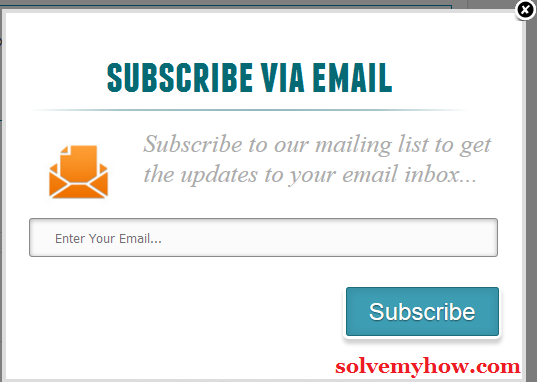 But today we will see how to add email subscription popup widget. Here I have made one awesome jquery plugin which fires email subscription box once in a week. If users close the box it won't be shown to him again and again. This is important because I guess you also do not want to irritate your reader right. As I said this is jquery plugin. So, to support jquery you have to add one <script> file into your blogger template. I recommend you to take your blogger template first. Step 1 :- Go to your blogger template. Now lets add email subscription popup code. Step 2 :- Now go to blogger layout. Step 3 :- Add the below mentioned code. Now, change highlighted part with your feedburner name. Step 5 :- Save the widget and close it. That's it. You have successfully added the widget. Found this tutorial interesting ? Why not help us by sharing this tutorial with your social media friends. You can find lots of social media buttons on the extreme left side.